Offsetting minors assessed to both teams with 5.3 seconds left in the second. Border battle emotions rise with just a few seconds left. Bristedt and Tischke each get called for roughing after the whistle. END 2: Minnesota leads Wisconsin 3-2. Badgers rally for two but Gophers score in final minute to take lead into 2nd intermission. Elsewhere in the Big Ten: No. 1 Penn State and No. 11 Ohio State in overtime right now. Big implications for UW. Penn State and Ohio State are now in a shootout. 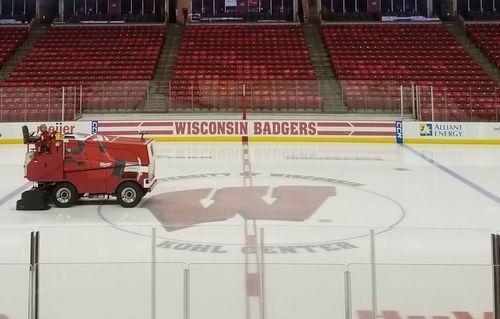 UW is winless in its last 49 games when trailing after 2 periods (0-43-6). Last win: 2014 B1G title game over Ohio State. Teams back out for the final period. Gophers holding on to a slim 3-2 lead. Third period starts at 4-on-4. Gophers lead the Badgers 3-2. We are underway for the third period of Border Battle hockey! 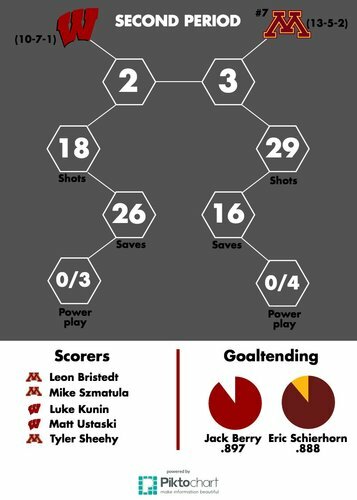 #Gophers have a 3-2 lead. Ohio State defeats Penn State in the shootout, so PSU gets just one point. A Badger comeback here would be huge for Big Ten standing. Not many chances for either team in the first four and half minutes of the third period. Over five minutes gone in the third and we'll have our first media timeout. SOG 32-18, #Gophers . Good pressure by the Badgers in the offensive zone for the past few minutes. They're still trailing 3-2 with 12:20 to go in the game. UW's Ford gets a shot into a pileup by the Gophers net but it stays out. 12:20 left, Minnesota leads 3-2. Schierhorn with a nice glove save to freeze the puck. 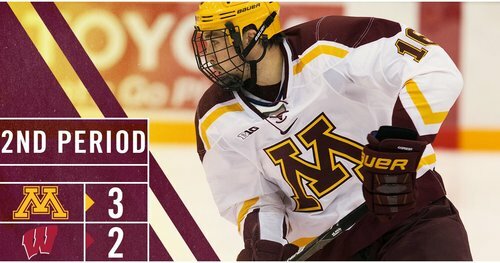 #Gophers still lead 3-2, 11:08 remaining in the game. Goal, Wisconsin. Somehow the puck got by Schierhorn and we are tied again. 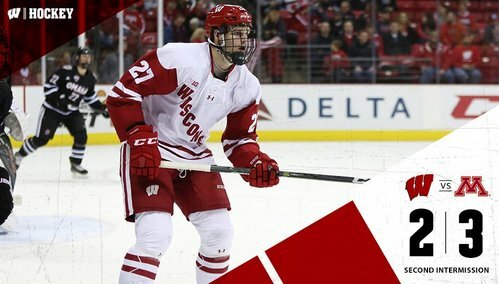 BADGERS GOAL: Hughes with a nice solo rush up the right and it somehow goes in. 3-3 with 10:39 left. Under review. It's a good goal! So it's 3-3 with 10:39 left in regulation. Goal counts. Went in off Frederic in the crease. TV timeout with 9:01 left in the third. UW and Minnesota are tied 3-3. 9:01 to play in the third and we will pause for a media timeout. 9:01 left in the third. Tie game. Great game. Stands are almost full. Well worth the ticket price.